The last 2 days have gone by in a blur of builders, rubble & dust, but it’s been worth it. 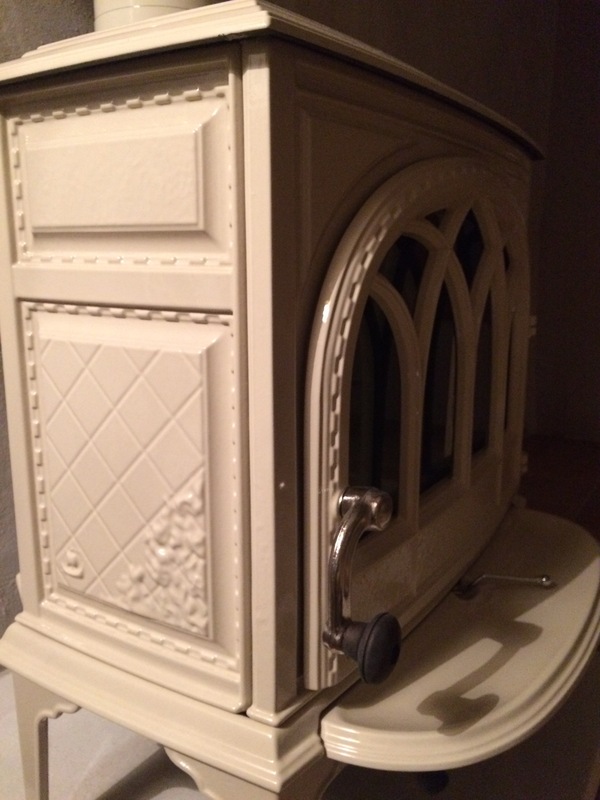 Having got rid of the hideous pellet burner (affectionately known as Growler) back in August, we’d been keeping our fingers well and truly crossed that the fireplace company stuck to their word and that they’d be out on 10th October to fit our new woodburner. Growler was not a looker! The clear skies of this last week have meant that the evenings are starting to get a bit chillier, so the thought of any delay in getting the new burner fitted was a little worrying. However on Friday Monsieur Gaudin from our local company at Caseneuve http://www.pagesjaunes.fr/pros/00788259 popped out just to check the final detail with me & said the workmen would be with me first thing on Monday. Now ‘first thing’ means different things to different people & often we’ve found it to be our equivalent of ‘mid-morning’. Luckily though I’m a bit of a ‘lark’ so yesterday morning was up, dressed & trying to move the sofa just to clear a bit of space, when shortly before 8 the vans drew up & the chaps had arrived. 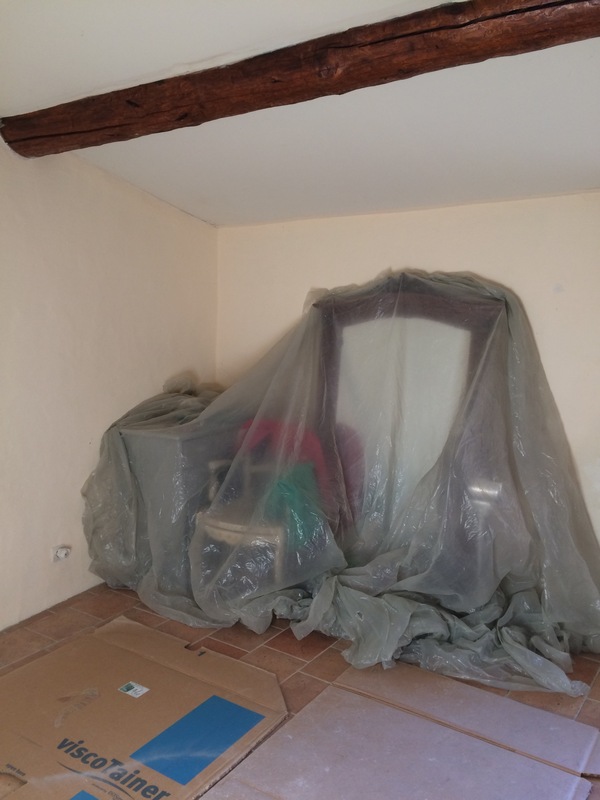 Within minutes of entering the house (in fact before the coffee had finished percolating) they had brought all their equipment in, had shrouded everything in plastic and had marked the ceiling to show where it would have to be cut to install the new chimney. 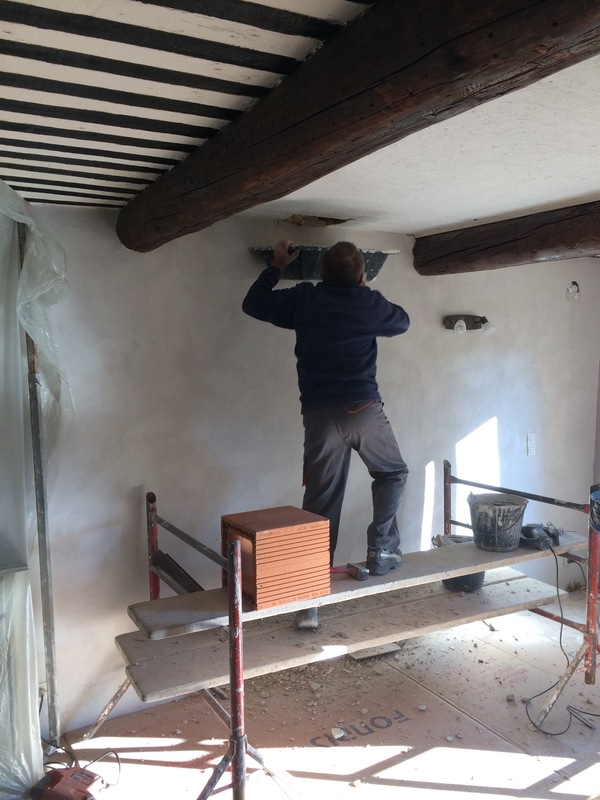 The next few hours saw frantic activity, filled with the sound of electric drills & saws whilst the holes were being cut through the old ‘Provençal’ ceiling and a full chimney being built up through the bedroom. By just before lunch they had achieved more than I thought they would have got done in a full day. The afternoon saw the chimney rise above the roof & by the time they left at 3.30 I had a new red-block chimney in place. 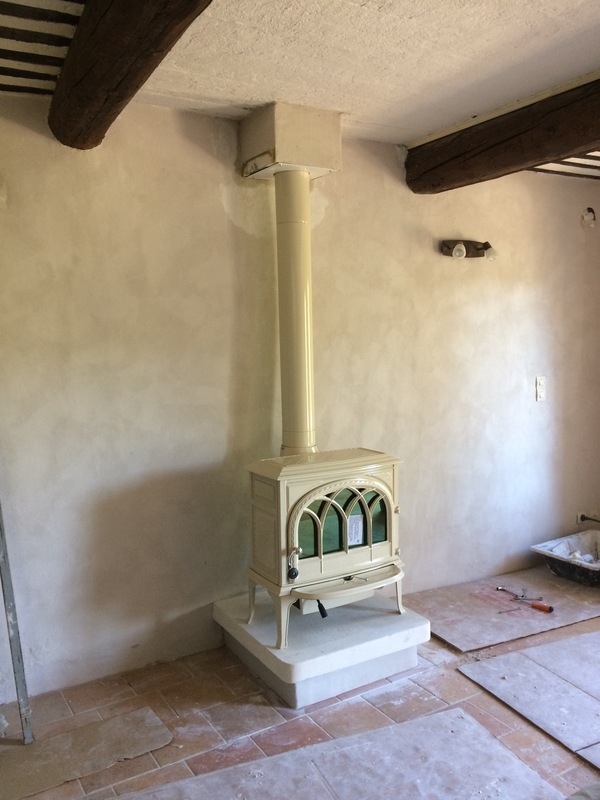 It looked a bit quirky through the bedroom as we really wanted the woodburner at the mid-point of the wall downstairs, but the roof beam was directly above so we decided to go for a slightly slanted ‘drunk-looking’ chimney to make sure it went where we wanted it. In a funny way it suits the uneven walls and actually sits quite comfortably in the house. 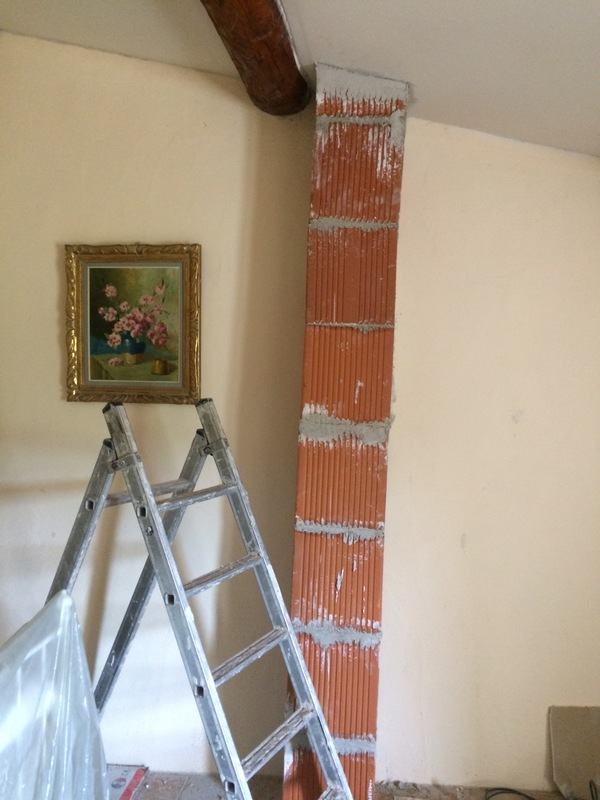 Our ‘drunken’ bedroom chimney – when nothing else in the house is straight this just fits in! 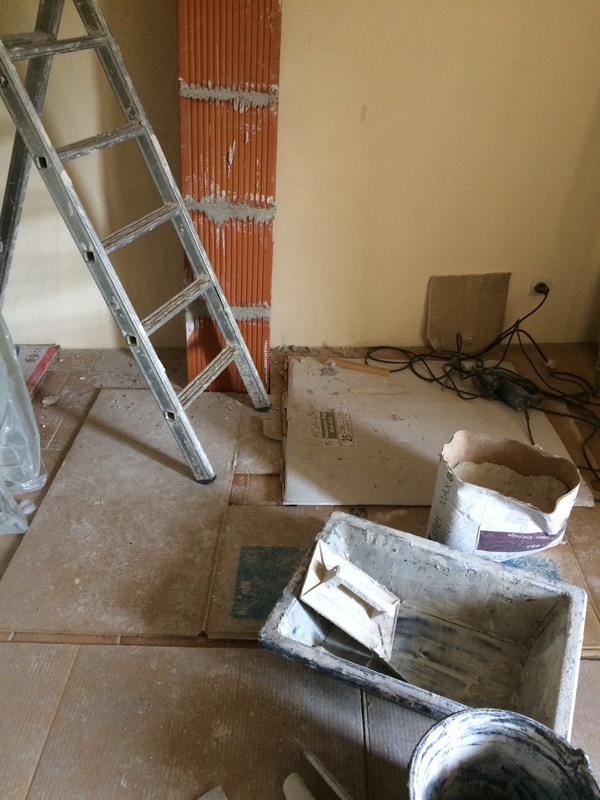 When they left (promising to be back ‘first-thing’, the house was effectively a building site & I spent the evening on a chair placed carefully in the middle of the kitchen, having to sleep in the spare room as our bedroom was full of rubble. No room even to get to tyh bed, let alone sleep in it! Today I was ready for the early start & so wasn’t surprised when they arrived at 7.45. Again within minutes the house was full of activity, with the chimney being plastered & holes made good. They then cleaned up before popping off to get the stone cut for the hearth. I did laugh when they returned that as well as unloading a beautifully cut piece of local stone, one of the chaps unloaded a microwave from the back of the van so he could cook his lunch – he had seemed quite taken aback the day before that we didn’t have one, so had clearly resorted to bringing his own! 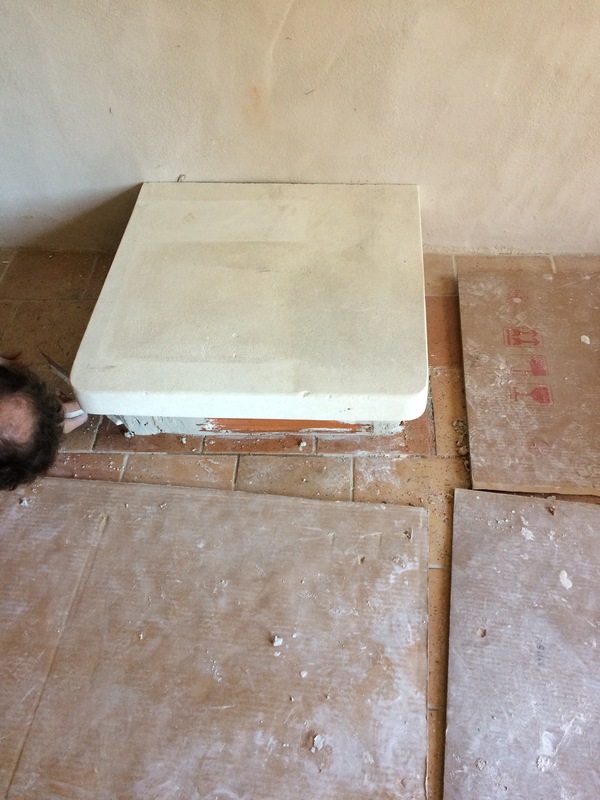 After a short lunch they cracked on again, building the plinth & hauling the new hearth into place. They certainly didn’t hang around – I was amazed at the pace of the work. 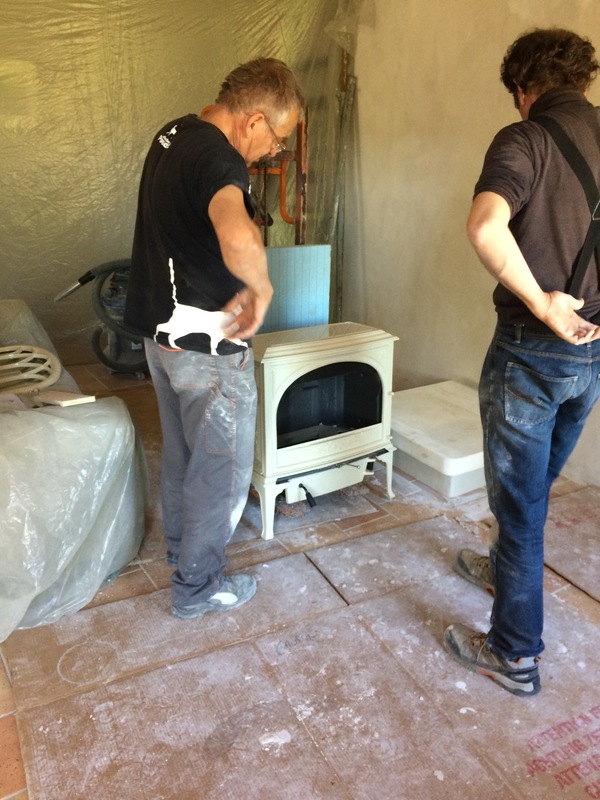 No long coffee breaks, no lengthy chats, just hard-work and all of a sudden they were ready to bring the woodburner in. One of the things we love most about our little house is that it’s on lots of different levels and the living room is on the first floor, which is great for us, but not for 2 chaps who have to carry a very heavy piece of ironwork up a quite narrow, slightly bent old tiled stairway! This clearly wasn’t something they were looking forward to & it wasn’t an easy task with lots of grunting & muttering as they made their way slowly up the steps, emerging into the room exhausted with comments about how it had certainly warmed them up! Within an hour it was done & the burner was sitting on its new hearth, looking to all intents and purposes as if it had always been there. I’m desperate to light it, but want to save that until I’m down here with Andy & the boys in a couple of weeks time. 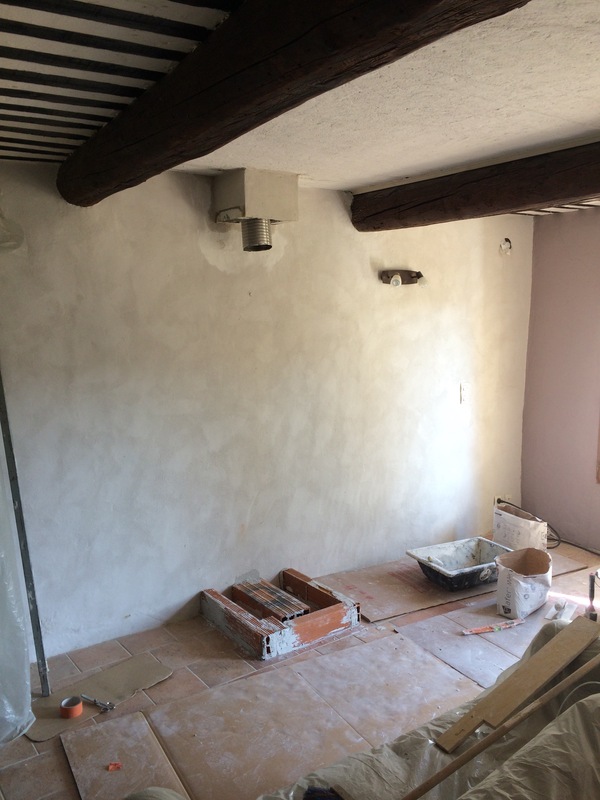 Also we don’t have any wood yet – that won’t be delivered until later in the month. 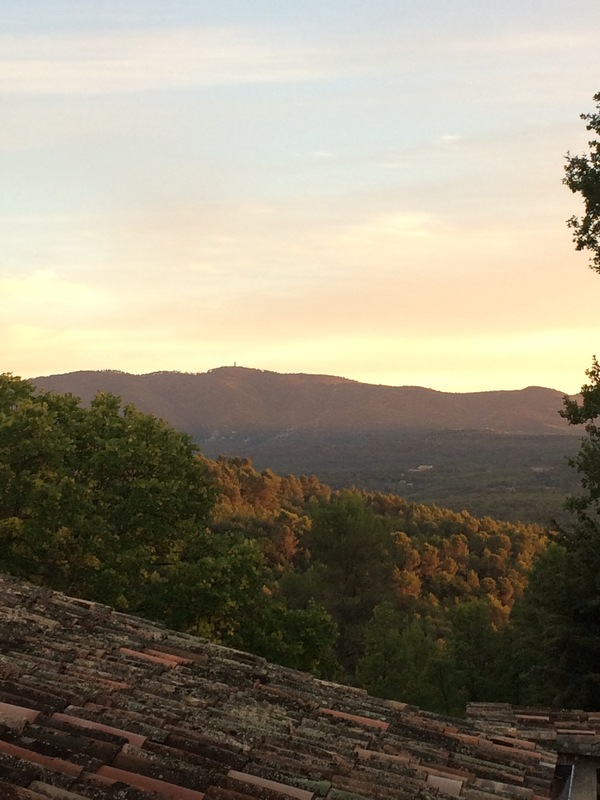 We’ve ordered wood from a local farm, ‘Bergerie de Berdine’ http://berdine.fr/ which welcomes people recovering from addictions to help their recovery and regain their ‘joie de vivre’ through working in a variety of ways within the small community that has been established there. It’s a great idea & is clearly held in very high regard locally as it was the first place that was suggested by many people as being the best place to buy wood. So bring on winter, let there be frosts and snow, let the rains come and the mistral howl – at least now we’ll be cosy with the shutters closed and our new woodburner ticking quietly as it heats up and casts a warm glow across the room. All that’s left is to light it! Previous Post Sunday morning Antiques’ hunting. Next Post I’ve found my chocolate heaven in Provence! 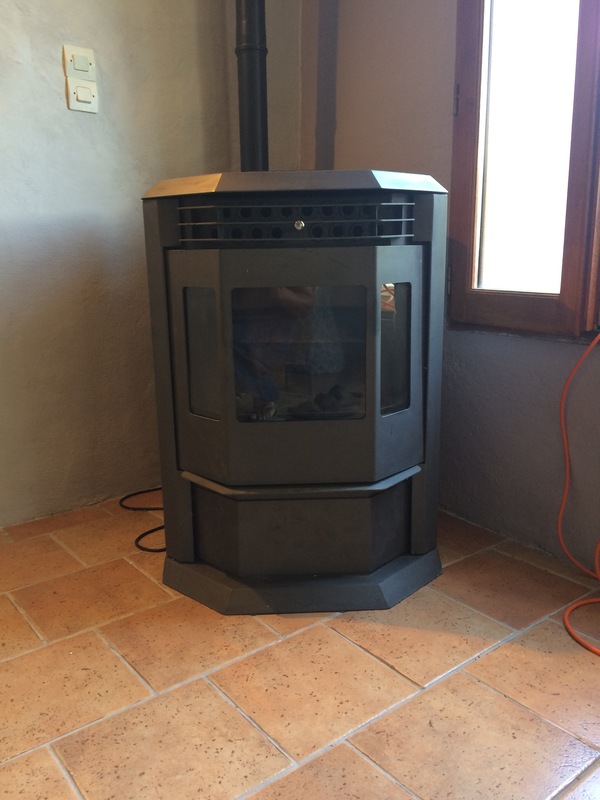 The wood burner is beautiful, and it appears to give you so much more room! 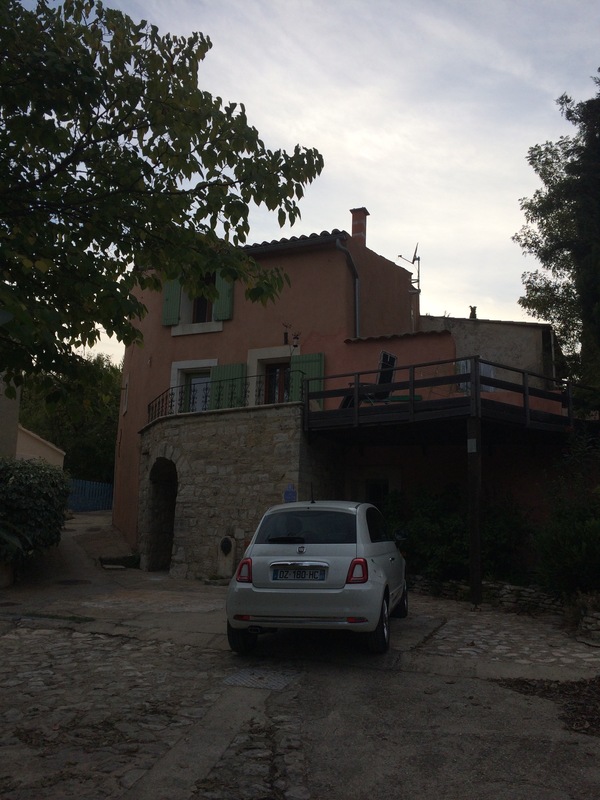 I love your house- perfect color, the shutters, the terrace – perfect Provence house. Thanks – I was sitting with a silly grin last night – it’s so much nicer than I ever thought it would be! I was just so impressed too with the local Fireplace company, arriving when they said they would with such a quick & high quality result !